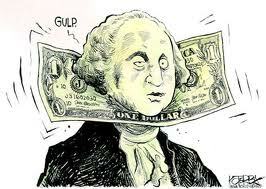 A Strong Dollar – The U.S. dollar can purchase more in foreign currency. Consumers will pay less for imports however foreign consumers will pay more for U.S. exports. This can hurt U.S. exports and have a negative impact on production and employment. 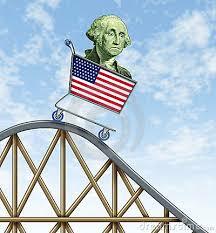 A Weak Dollar – The U.S. dollar purchases less in foreign currency and consumers will pay more for imports. Foreign consumers will pay less for U.S. goods and services which helps increase production and employment in the U.S., but can contribute to inflation. So which one is ideal and where would we ideally like to see the dollar? The answer is neither… in a perfect world we would like to see a balance between the pros and cons associated with a strong and weak dollar. In past articles we have discussed the role of the Fed. When the Fed releases their opinions on the U.S. economy much of their time is spent discussing the current state of the dollar. Often the most challenging component in currency policy is taking into account the economies of our trading partners. For example a dollar that is strong in comparison to the Euro will in effect weaken the Euro. Products from Europe will be more affordable for U.S. consumers and they will be encouraged to travel to Europe as vacations suddenly become much more affordable. This can help European nations that are struggling with recession and unemployment. The United States is certainly a power player with the global economy. When looking at investing in currencies, however, the picture becomes much more broad and there are so many options to consider, often the most prudent investment is to invest outside of the U.S. dollar. There are three characteristics to consider when looking at investing in the currencies: volatility, correlation and style of management. Volatility: Investors often view investing in currencies as nothing more than a wager on future movement, this could not be any further than the truth. Historically speaking, currencies have been significantly less volatile than stocks. While they are very different, the approach to investing in currency markets should be viewed much like the equity markets. An investor should never simply buy one stock and expect to get the returns they are looking for. The same is true when looking at currencies; consider investing in the entire asset class and not limiting yourself to only one country or region. Correlation: As we mentioned, on a historical basis currencies have been much less volatile than stocks. While you will not find a year with +25% rate of return (unless you are taking on a ridiculous amount of risk) you will also not see a -25% correction in this space. Diversifying into the currency asset class may not only improve the risk/return of your portfolio it might help protect against downside risks. Style of Management: When you consider the number of factors and key players that can have an impact on the global currency market it can be overwhelming to say the least. Consider this – the global currency market is the most liquid market in the world with daily transaction over $5 trillion! Compare that to the U.S. Bond Market and New York Stock Exchange that combine for under $1 trillion! When you also factor in the aspect that each country has their own agenda and motivation there are often market inefficiencies that knowledgeable investors can capitalize on. You can certainly invest in this space by utilizing ETF’s (Exchange Traded Funds) or other investment vehicles but simply buying exposure to the dollar, euro or yen and holding it is not a recipe for success. We would encourage investors to find an actively managed position that has the ability to take advantage of this quickly changing investment space. Take caution however as there are many investments that position themselves as a currency play but they are limited in what they can invest in and what countries they can have exposure to. In times past access to alternatives investments was certainly limited if not completely closed to the average investor, but the barriers to entry have changed and they are now accessible to all. For years institutional investors and endowments have been using Alternative Investments with impressive results. Consider this… a recent study looked at 14 universities endowments all managed by some of the largest and most well-known investment firms in the U.S. At year-end 2013 the average percentage of these endowment funds that was allocated to alternatives was 59.2%! These are institutions that no one should take lightly, among the list is: Harvard University ($30.7 billion), Stanford University ($17 billion), Massachusetts Institute of Technology ($10.3 billion) and Yale University ($19.3 billion). If these large institutions realize the value and importance that alternative investments warrant in an investment portfolio isn’t it time that you consider it as well? If you have questions on currencies or alternative investments in general, contact us at your convenience. This entry was posted in Alternative Investments, Asset Allocation, Currencies, Currency Market, Diversification, Dollar, ETF, Exchange Traded Funds, Federal Reserve, Investing and tagged Alternative Investments, Asset allocation, Investing, S&P 500, Stock Market, Wall Street by Matt@DearMrMarket.com. Bookmark the permalink.